NBC's BIG THREE OF TUESDAY NIGHT COMEDY - FIBBER McGEE & MOLLY, BOB HOPE AND RED SKELTON. Tuesday is best remembered as Comedy Night during the Golden Age. As evidenced by the list of programs that scored three or more seasons among Tuesday’s Top Ten, (below), 14 of the 16 qualifying entries - regardless of their basic formats - contained elements designed to make listeners laugh. NBC led the comedy pack with its 90 minute Tuesday lineup of Fibber McGee & Molly followed by Bob Hope and Red Skelton - an unchallenged block of popularity in the early World War II years. As reported in complete detail in Network Radio Ratings, 1932-1953, Hope and Skelton both peaked on Tuesday, January 19, 1943, with record-setting Hooperatings topping 40.0, which represented some 35 million listeners Their outstanding night benefited from the lead-in of Fibber McGee & Molly with their zany of Wistful Vista neighbors who delivered a rating approaching 38.0. But which of these shows - if any - leads the list of Tuesday’s All Time Top Ten? And how did the two mysteries that played it straight, Big Town and Eno Crime Club, figure into the list - or the successful mystery/comedy series Mr. & Mrs. North? You also have to consider music shows headlined by Al Jolson, Ben Bernie and Ginny Simms and audience participation notables People Are Funny, We The People and Battle of The Sexes. Also on the list of potential winners are the early successes of Ed Wynn and Buns & Allen plus two sitcom hits of later years, A Date With Judy and Life With Luigi. Six Multiple Run shows also had three or more Top Ten seasons on Tuesday night,. But your challenge is to rank Tuesday’s All Time Top Ten in order from the 16 programs and personalities listed below. They're listed in alphabetical order along with the number of times they registered Top Ten seasons on Tuesday night over the 21 years of the Golden Age. Hint: Don’t depend too much on the obvious. There’s more than one surprising winner in the final results. 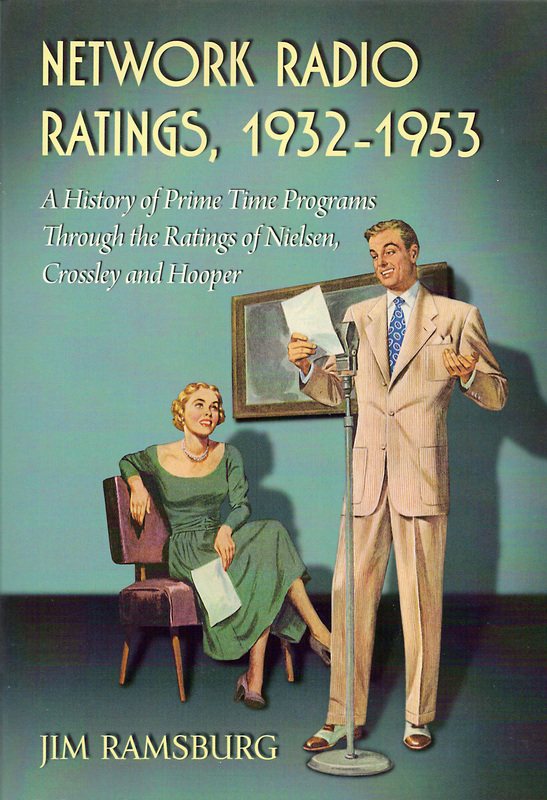 Look beneath the book cover below to learn how the millions of Network Radio listeners ranked Tuesday’s All Time Top Ten. 4/ Red Skelton joined Fibber McGee & Molly and Bob Hope in NBC’s Tuesday’s comedy block in 1941, and except for the 1944-45 season spent in the U. S. Army, he remained until 1948. Over those six seasons Skelton scored one first place season, four in third place and one in fourth for 49 points. Without question, had he not been drafted at the height of his popularity then moved on to Fridays in 1948 and the CBS Sunday schedule in 1949, his Tuesday total would have been much higher. 6/ Mr. & Mrs. North was another successful transplant, moving from NBC’s Wednesday night lineup and five Top Ten seasons, to CBS on Tuesday, where it scored six more returns to the Top Ten. The mystery/comedy series starred Joseph Curtin and Alice Frost for its first nine seasons. They were replaced in 1951 by Richard Denning and Barbara Britton who also played Mr. & Mrs. North on television. The series’ Tuesday night run resulted in 36 points. 7/ Ben Bernie was one of the early stars of Network Radio‘s Golden Age. The bandleader/comedian who referred to himself as “The Ol’ Maestro” and to his orchestra as “The Lads“ generated three of his Tuesday Top Ten seasons on NBC. Surprisingly, his move to the Blue Network in 1935-36 resulted in Tuesday's Number One rated show. His four seasons combined to give Bernie 33 points. 8/ Al Jolson was a network vagabond, bouncing between NBC and CBS over four nights of the week in his ten seasons spanning 17 years. His first Tuesday run from 1936-39 on CBS resulted in two first place finishes and another in second. His return in 1942-43 finished in a disappointing eighth place. The legendary entertainer’s four season Tuesday total was 32 points. 9/ Ed Wynn, like Eddie Cantor, was a comedy super-star of the early Golden Age. But unlike Cantor, Wynn’s Texaco Fire Chief show flamed out after three seasons and “The Perfect Fool” never regained his Network Radio popularity. His two first place finishes on Tuesday in 1932-33 and 1933-34 plus second place in 1934-35, results in 29 points. . The remaining candidates for Tuesday’s All Time Top Ten were: A Date With Judy and We The People - 26 points each, Burns & Allen - 21 points, Ginny Simms - 10 points, Eno Crime Club - 8 points, and Battle of The Sexes - 7 points. Multiple Runs: The above was limited to the weekly programs heard on Tuesday nights. If the Multiple Run programs heard three to five nights a week had been included, Tuesday’s All Time Top Ten would have put Lowell Thomas News in third place with 73 points and Amos & Andy in fourth with 65.